Start a build off in one of the strongest possible way and snap up one of the best 300 series motherboards your money can get you. Simultaneously able to improve clock speeds and core counts, but only compatible with 300-series chipsets, Intel’s Coffee Lake processors are a bit of a double-edged sword. Thus, the decision to get one of them and what their benefits can offer you and your PC can be a little tricky. However, to make this process slightly easier, this handy guide to the best Z370 motherboards should help you along your way to get a mobo that will harness and house the processor to set up for a gaming fury to be unleashed in your rig. As time has gone on, the 300-series motherboards have, much like everything else in a way, become more affordable and so you can readily get your hands on a board from a trusted manufacturer for impulse-purchase level prices. In addition to the price, one of the best Z370 motherboards will still get you more features and more ‘horsepower’ for your money and they will still provide you with a great component for a refresh of a current build or to start a new one. Intel will inevitably expand their 300 series portfolio in the future with the Z390 chipset, but until then you can rely on this page to show you the best Z370 motherboards (and best H370 boards that offer a nice alternative) available now. The latest Asus Hero board is the ROG Maximus X Hero (Wi-Fi AC). It's a mixed victory for Asus, winning the category but bumping the more expensive Maximus Formula from consideration as primary high-end pick for Z370. You'll be hard pressed to find a reason to go beyond the Maximus X Hero when putting together a Coffee Lake rig. 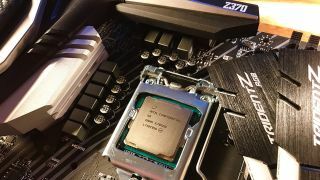 The minor bumps in speed, features, or fashion that costlier Z370 boards provide are difficult to justify given X299 is Intel's true high-end platform. This year's model adds 802.11ac 2x2 MU-MIMO Wi-Fi to the networking mix, although non-wireless versions are also available if you want to save a few bucks. Overclocking remains first in class, with stable, water-cooled 5.1 GHz overclocks on the i7-8700K reachable using only slight voltage changes. VRM temps, a problem with many early Z370 board designs, aren't an issue here. Memory support on various test DIMMs up to 3600MHz was flawless, with adjustments to timing only required when clocking DDR4 beyond specifications. Performance was equally impressive with benchmark numbers reflecting the speedy overclocks the Hero sustains, putting it in league with boards costing a third more. The board includes a nice selection of board mounted controls like reset and power buttons, a POST code display, a clear BIOS switch, and a memory reset button. Fashion-wise the Hero doesn't vary much from its previous gunmetal grey iterations, adding some more heat sink jewelry in the motherboard's center over one of the board's dual 32 Gb/s M.2 slots along with accompanying backlit RGB illumination. Preinstalled shrouds and backplates for the I/O panel ease installation, lending a premium feel, and the color combos are neutral enough to work with most components. Also new on the Maximus X Hero is an addressable RGB header, which allows for compatible RGB strips to display multicolor patterns instead of solid colors. Asus continues to use the current top-of-the-line ALC1220 codec, along with the typical SupremeFX enhancements and an ESS Sabre9023P DAC. USB gets a board-mounted 3.1 Gen 2 socket for front panel usage. The board is nearly perfect, with better Wi-Fi and an extra M.2 slot on our short list of potential improvements. Maybe we'll see those in a Z390 version, so stay tuned. Gigabyte isn't as flashy as the other top-tier motherboard manufacturers, but the Aorus Z370 Gaming 5 punching way above its midrange weight class. Priced well under $200, the Gaming 5 delivers triple M.2 slots, Intel Wi-Fi and Ethernet, a full RGB treatment with multiple headers, and ALC 1220 audio. All-out performance isn't the typical forte of the Aorus line, which strikes a balance of features and style alongside absolute number chasing, but the Gaming 5 acquits itself well in that area nevertheless. The board has 10-phase CPU power delivery, dual BIOS, and memory support up to a theoretical 4133MHz. Testing reveals more modest limits, but the 3466 and 3600 G.Skill and Corsair DDR4 kits ran without incident. Processor speeds are similarly impressive, almost topping the 5GHz barrier. Gigabyte does cut a few corners, like with the 1x1 802.11ac Wi-Fi, and there are no mounted power buttons, overclocking switches, or other controls, although the POST code readout is thankfully present. This motherboard wants to spend its day gaming in a nice windowed case rather than be tinkered with all day on a workbench. For most gamers, this isn't a problem. If you're planning a tight build take note: the Z370 Gaming 5's shielding and styling suffer from some bulky areas, such as the AMP UP audio section, which can cause issues when seating some bigger video cards. There have also been reports of loose VRM shielding from users in support groups and elsewhere, although this wasn't the case for the sample tested here, so keep an eye on build quality before the return period is up. The ASUS TUF H370 Pro Gaming Wi-Fi makes an impressive debut for the series in our guides, sweeping the budget list of features while bucking trends left and right. It's a rebel. It sheds the armor plating for a bare-it-all retro look that back-to-basics rig builders will love. Clad in simple black and silver, with just a touch of RGB lighting along the right edge, it looks sharp and supports almost any color combination you toss at it. Under the hood, the TUF Pro Gaming packs dual M.2 slots, 10 Gb gen 2 USB 3.1, Intel v219 Ethernet, and a robust 2x2 Intel 9560 802.11ac adaptor that supports MU-MIMO and 160MHz wide channel modes, shaming the competition in a price segment where Wi-Fi is rarely found. Audio is less impressive, with the older ALC887 codec that's a step down from the latest tech. The H370 chipset doesn't support overclocking or higher memory speeds, but that doesn't hold the TUF Pro Gaming back in real-world testing, where it holds its own in gaming evaluations against more expensive Z370 boards and overclocked system configurations. And for gaming purposes, an upgraded GPU would be a better use of funds than an overclockable CPUs, fast DDR4, and a motherboard upgrade. Since the Z270, Asus's ITX Strix entry has slipped ahead of ASRock's Killer ITX offering to earn first place in this boutique segment. Despite its diminutive size and paucity of upgrade options, the ROG Strix Z370-I Gaming provides excellent performance and value. Boasting stable 5GHz overclocks using several memory speeds, including 3600MHz with tweaking, its single PCIe x16 slot pushed a GTX 1080 Ti to speeds that matched or exceeded most Z370 ATX boards during testing, scoring better than its size and price class suggest. The feature list is lengthy, with a full array of USB 2 and 3 ports, including USB 3.1 Gen2 type-C and a socket for front panel USB 3.1 Gen2. Asus softens the blow of ITX's single PCIE and two DIMM slots by providing an M.2 slot under the chipset heatsink with a second on the backside of the board, allowing a bit of upgrade potential not usually found in this form factor. Both M.2 slots support 32Gb/s transfer speeds. Networking is also robust, with Intel v219 Ethernet paired alongside an Intel 8265 2x2 802.11ac Wi-Fi module, and audio gets the full Z370 ROG SupremeFX treatment, with an ALC1220A codec supported by isolated circuitry and headphone amps. It's a dense set of features, but the Strix Z370-I's clean design makes for quick system assembly and configuration. Just be sure to install that bottom-mounted M.2 drive beforehand or pick a case with a cut out in the right area, or you'll be taking everything apart again. There are also a few sharp headers, so be careful to avoid involuntary blood donations when installing the board in a tight case. When possible, all tests are performed with the same components installed to remove any variables except the motherboard itself. We also research the entire field of Z370 motherboards and narrow the list down to the best, most competitive boards before choosing each round of boards for the guide. Including the category winners listed above, we also tested the following motherboards. Some of these represent a reasonable alternative to our primary picks, and a good sale can be the difference between mediocrity and excellence. Here are the boards we've tested in alphabetical order. This ITX entry from ASRock offers a similar feature set to Asus's Z370-I Strix for $50 less, but offers lower performance and last-generation audio quality. It does include dual Intel NICs as well as fast Wi-Fi and is a good pick for budget-conscious ITX shoppers or special projects. If you're going for maximum performance and overclocking, with a great set of features as a bonus, the latest iteration of the Maximus Hero line delivers. It's fast, looks good, and only costs slightly more than good midrange boards. The Strix Z370-E Gaming has a good feature set but comes up short on features compared to the midrange pick from Gigabyte, which features an extra M.2 slot. It's also too close in price to Asus's own Maximus X Hero on the high-end, and for just a few bucks more that board offers better performance and style. Our favorite mini-ITX board also goes to Asus, edging out the ASRock board. Don't let the small size fool you, as the Strix Z370-I can overclock nearly as well as full ATX boards. The only thing you might miss is additional PCIe and RAM slots. Our budget pick packs a great feature set, including the fastest Wi-Fi of the bunch. If you're not going to overclock your CPU, or if you're buying a non-K processor to begin with, there's little need to go beyond Asus's TUF H370 board. This bargain basement board seems to cut corners in the places wrong all. (Yes, that's a joke.) Low USB port counts, poor overclocking results, and low-grade audio make you wonder what happened to Asus's storied Prime and Signature lineups from past chipsets. Our midrange pick includes three M.2 slots, but more importantly it looks good and is easy to use. Not the best pick for maximum overclocks, and the 433Mbps Wi-Fi is a bit chintzy, but it's a great board in every other respect. This feature-packed board tries hard but the VRMs run warm and the feature count is down one M.2 slot on Gigabyte's less expensive Z370 Aorus Gaming 5, the current Z370 midrange pick. MSI's Tomahawk was our Z270 budget pick and the Z370 variant delivers the same mix of features and performance that won it a slot last time. The only problem is that everyone else has upped their game. Still a good board if you're looking for budget alternatives, plus the Z370 chipset means it can overclock K-series CPUs. Welcome newcomers to the motherboard market, NZXT has a credible first effort that shows promise but comes up short on overclocking features and high on price. The sense of style and thoughtful design behind the N7, as well as NZXT's willingness to listen to customers and cut the price after release, bode well for future offerings.